Lara-Jo “LJ” Houghting joined Churchill Yacht Partners in December 2010 adding value to the already established charter department. LJ’s love for the water began in early childhood having grown up in a family of water sports fanatics. Her greatest passion lies in racing her father’s trimaran and keel boats. LJ was initially introduced to the mega yacht industry in 2001 as stewardess and massage therapist onboard luxury private and charter yachts.Here she offers her expert tips to chartering around Maine. The Maine Coastline is best explored by superyacht for several reasons; firstly, the coastline extends more than 3,400 miles (making it larger than the Californian coast) with no defined “coastal road”. This is due to the rugged mix of nooks and crannies making it impassable by road. Secondly, there are 4,613 islands along the coast (according to the Maine State Planning Office’s Maine Coastal Programme) just waiting to be explored. Maine, is certainly an itinerary off-the-beaten-path that is perfect for tranquility and picturesque coastal towns, including a coastline of quaint lighthouses. Much of the cruising can be accomplished with short distance island-hopping, which is protected by the outer islands. A top tip? Be sure to keep a look out for porpoises, seals, and migrating whales. Portland International Jetport (PWM) is a public airport located two-miles (three-km) west of the Central Business District of Portland, Maine. Besides the international airport, Portland is a fantastic bustling city to visit for entertainment, nightlife, shopping etc. Moor in DiMillo’s Marina, it is a full service marina and the perfect spot for your superyacht to dock for embarkation. Miyake Restaurant on Fore Street: A sushi restaurant influenced by Chef Masa’s years of experience at highly acclaimed French and Italian restaurants in Tokyo and New York. Fore Street: Ambiance, open kitchen, extensive wine list, that features local ingredients. Portland Lobster Company: Fantastic spot on the water serving fresh lobster, be sure to try their local Maine Beer Company “Zoe – one happy, happy Amber Ale”. Monhegan Island is 1.4 miles long and 0.7 miles wide. It is described as a self-sufficient, independent isle only 10 miles out to sea. There are several hiking trails to explore, but be sure to look out for the “fairy houses”. Cruise Penobscot Bay (the second largest embayment along the East Coast) to Hurricane Sound, Vinalhaven is where you will find quaint villages and uninhabited beauty. In the late 1870’s Hurricane Island was a thriving community due to quarrying at the time. Ask your captain to drop anchor and wash-up for a lobster bake on one of the private islands – Butter Island is a firm favourite. Castine is another highlight not to be missed. Home of Maine Maritime Academy and marine related industries. 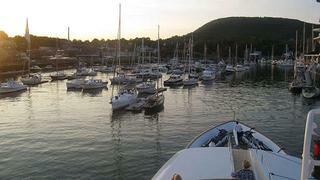 Day One : Join the yacht in Portland, head to Christmas Cove up the Damariscotta River in South Bristol. Second Day : Cruise to Monhegan Island for a hike, then cruise to Hurricane Sound, Vinalhaven. Third Day : Explore Camden for the day. Fourth Day: Cruise to Butter Island for Captain Greg Russell’s Lobster Bake, then on to Castine. Sixth Day : Somes Sound then Bar Harbour. Seventh Day : Explore Bar Harbour. 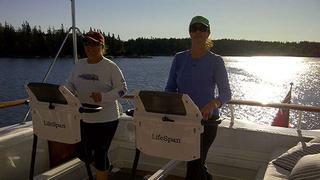 Eight Day : Depart from Bar Harbour. The annual Rockland, Maine Lobster Festival is usually late July-early August.